I don’t like the phrase “daddy issues” it’s now just another way of saying a girl is crazy. Someone shared with me once about her friend and how she went off the rails. “I don’t know, she has daddy issues so she’s crazy.” She continued talking about her friend and the things she was doing that elected her crazy and it was like I was pulled out and everything became fuzzy. I started to have flashbacks of my father, images of him twirling me around and dancing with me. Of me sitting in his lap as he held me close talking to me, only I can’t hear what he’s saying. It’s not like the movies either there’s not a break in the scene where you all of a sudden are watching something that has happened. It’s re-experiencing those moments with all the feelings involved. Sometimes they are moments I remember and other times I’m shocked by the memory that was lost and how clearly I remember it now. For years I’ve fought against unfurling my childhood trauma it was uncomplicated and painless to just act as though it didn’t occur. My husband has always motivated me to make progress to draw nearer to freedom and to God. He recognized years ago that this 20+ years of fight has drained me and urged me to get help. I started taking medication for depression and anxiety several months ago. For me NOT taking medication was the last thing I had left. I had lost my passion to love, to parent, to eat, to laugh, to move and to live. I felt like everything had been taken from me by this unseen force that was killing me from the inside out. But the decision to take medication was mine and I was going to hold onto it until it bled the life out of me. Understand, I had believed that I would lose myself, that I was weak, that I would be taking the easy route. All of these lies. Now, now I know how sorrowful I had become and how all I needed was to let go, let go of my pride and trust the journey. A friend once told me that depression and anxiety was one of the best gifts God has given him. How could so much pain be a gift?! I understand what he means now. Being honest and open about my story has brought me so much freedom and I have made so many incredible friends who have suffered through so much pain. It’s surprising to see how many people are suffocating and drowning and we don’t know. It’s an incredible feeling to be vulnerable with others and be able to help them even if it’s in a small way. 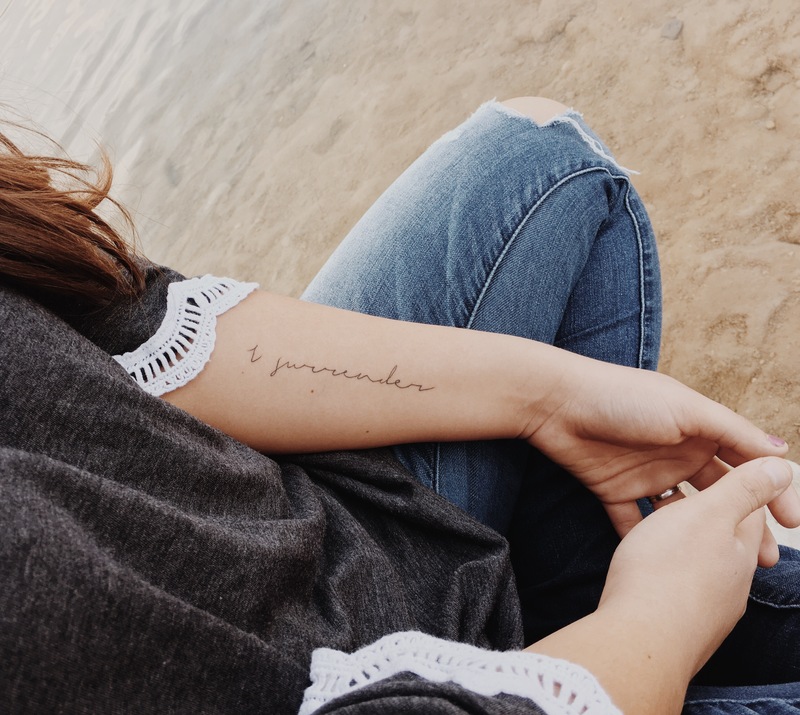 My tattoo reminds me every time I take my medication that God wants me to trust Him with my weakness so he can give me strength and to that I say… I surrender. To my friend out there with the “daddy issues” who is crazy. I’m sorry your first love left you. If I could I would pull you in close, hug you tightly and whisper in your ear…I’m crazy too. Previous Article Why I started a blog and got a dog. You are an inspirational person! I am crying, this was, is beautiful.